Der Hegau - Activities - Offizielle Seite des Hegau Tourismus e.V. Are you the kind of person who likes to exercise and enjoys being surrounded by unspoilt nature? If you wish to get away from the well-trodden paths of mass tourism, then you will certainly enjoy being in the Hegau. Being close to both Lake Constance and Switzerland, the Hegau is an ideal starting point for a rich and varied holiday. Those interested in water sports will certainly find what they are looking for. Choose from the romantic setting of the Aachbad in Singen, located on a river island directly beside the site of the state garden show or, outside the bathing season (which lasts from mid-May to the end of August), in the indoor swimming pool in Singen. The Aachbad is surrounded by marvellous scenery, located directly beneath the Hohentwiel, and offers a wide range of sports and leisure facilities, including a diving tower, a beach volleyball pitch, and an 86-metre-long water slide, as well as a barbecue area, a restaurant, and more. Throughout the Hegau, there are many outdoor swimming pools, the majority of which are located in highly scenic settings. Of special interest is Lake Steisslingen, located near the town of the same name in the Hegau. This small, idyllic lake is a well-kept secret and highly recommended for families. Or how about a refreshing swim in the Rhine? Yes, you read it right. When the Rhine leaves Lake Constance, it is as pure as drinking water and fantastic for swimming. In Gailingen there is the wonderful Rhine swimming area, with its great selection of restaurants and well-maintained leisure facilities. If your prefer things a bit more peaceful, you can find a wonderfully designed crazy golf course at the Freizeitzentrum Süd (leisure centre) in the south of Singen. For horse fans, there are two horse riding facilities in Singen; they have published their own brochure entitled "Reiten im Hegau – Urlaub im Sattel“ ("Riding in the Hegau – A Holiday in the Saddle"), which contains all the information you need about trail riding, riding courses, and riding holidays with your own horse. But what could be better than discovering the Hegau, the nearby canton of Schaffhausen, and the charming Untersee (lower lake) area on foot or by bicycle. Our landscape is a paradise for hikers and cyclists alike. The Hegau Tourismus e.V. has plenty of information available, including route suggestions and detailed descriptions for hikes of varying lengths and difficulties. 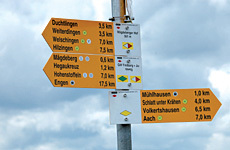 You can walk from one romantic Hegau mountain to the next and the routes take you past the most attractive viewpoints. You can cross the German-Swiss border several times without even noticing. Walk through the romantic millstream gorge with its remains of historical mills and millwheels that actually still work – there is almost no end to the variety of suggested routes. Whether you prefer a relaxed walk or a several-day tour including luggage transport and advance hotel bookings, we can offer you just what you need. The Hegau also has much to offer cyclists. We have recently created a 650km-long network of cycle routes in the Hegau and the canton of Schaffhausen, which caters for all requirements. There are, for instance, fifteen cycle routes that lead through the most attractive areas of the Hegau, on the tracks of the old stagecoaches, which Goethe once travelled on. Another special feature of the tours for both hikers and cyclists, in addition to them being cross-border, is that they can be combined with the ships of the "White Fleet" on the Untersee and the Upper Rhine as well as the "Seehas“, a modern local train that connects Will and Frauenfeld in Switzerland with the small Hegau town of Engen, leaving every thirty minutes, on a route that takes it across the entire district of Konstanz, passing by all of the most attractive destinations on either side of the border. Of course, both the ships and the Seehas are able to transport bicycles. Or how about a canoe trip on the Untersee? Discover the lake landscape from a completely new perspective. Our route suggestions range from an afternoon trip to an extended tour from one side of the lake to the other. You can borrow canoes at various places and return them at the end of the trip, without having to go back to your starting point.